My family played a lot of games growing up and I still love games. Every holiday, when we are together, the nightly question is ‘what are we going to play? 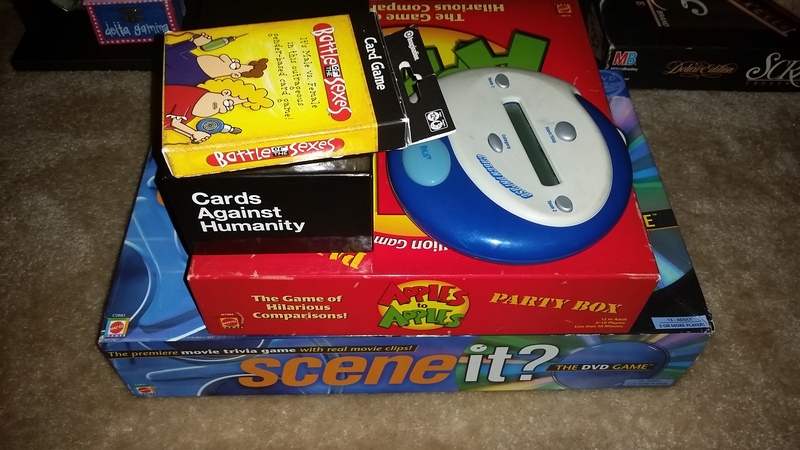 !’ Luckily I also have friends who love games, so I like to have a game night every now and then – though it doesn’t happen nearly often enough. Apples to Apples: the judge reads a green apple card and players play a card from their hand that matches best. the judge chooses which red card he/she likes as the best match. Celebrity: each person writes 2-3 names of celebrities and/or well-known characters. Divide into two teams. Alternate one player from each team, drawing names from the bowl in 3 rounds. First round you can say whatever you want to describe the person/character. Second round you can only say one word. Third round is charades. But it’s the same people/characters each round! Pictionary: get your team to guess the word by drawing it. Most entertaining when played with a white board. Does your family play games? What are your favorites? Categories: Wonderful Wednesday | Tags: games, party | Permalink.